An ancient Ayurvedic nasal self-care ritual is reimagined for today with this beginner-friendly kit. According to the ancient Hindu medicine system of Ayurveda, the nasal passageways are the entryway for "prana" (our breath and life force energy), via a direct route to the brain. For thousands of years, people have followed this nasal self-care ritual to keep that vital passageway clean, clear, and healthy. Curious? 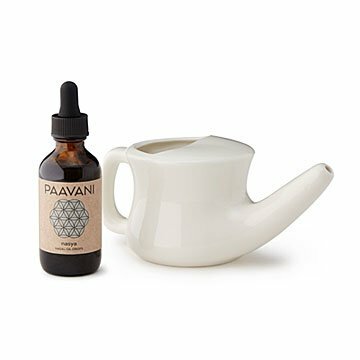 This kit makes it super easy for beginners to develop and maintain a nasya oil practice daily (a drop in each nostril) and a deeper, weekly neti pot salt water rinse ritual for the whole sinus system. It's a great way to initiate or deepen a personal Ayurvedic practice. Handmade by a team in Nevada City, California.